The Hall Bridge stands at the north side of Route 121, just 3.2 miles from U.S. Route 5. Sanford Granger, the premier builder in the area, built the bridge in 1867 using the plank-lattice truss. Unfortunately, Granger's bridge collapsed under a truck in 1980. The 120-foot structure that now spans Saxton's River was erected in 1982 by Milton Graton and Sons as an authentic replacement, using traditional methods and materials. A bridge historian commented that the span was originally constructed with what he described as flying buttresses. These devices, no longer in evidence, were extended floor-beams with a diagonal brace to the top of the truss to supplement the lateral braces under the roof rafters. The purpose of the bracing is to keep the trusses standing upright and aligned against lateral forces from wind and water. Examples of buttresses in use can be viewed at the School House Bridge in North Troy and at the Scott Bridge in Townshend. All of the bridges known to have been designed by Granger feature extended gables except this one. Here, only the gable-end roof overhang extends over the portals, and the gables are sheathed with clapboard rather than the usual vertical planking. The rounded portals are finished with "keystone" and pilaster molding. The Hall Bridge has two unusual features. 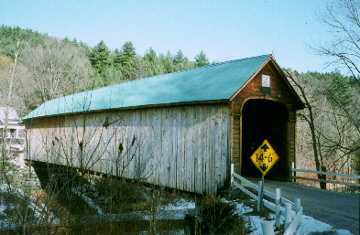 First, its portals are twelve feet wide, true to the dimensions of the original: the narrowest portals of all of Vermont's covered bridges. Second, the planks used in the lattice and in the chords are four inches thick instead of the usual three inches. These planks are probably heavier than the original. Cables have since been added to the exterior structure to give additional lateral support. The original bridge was on the National Register of Historic Places. The replica has been designated a scenic resource by the town. It once served Barber Park, the town's celebrated amusement park and picnic grove. Today it serves unpaved Paradise Hill Road leading to Bellows Falls' village forest. The bridge has also been known as the Barber Park Bridge, and the Osgood Bridge.